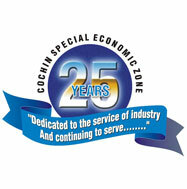 The office of the Development Commissioner, Cochin Special Economic Zone is a sub-ordinate office under the Ministry of Commerce and Industry, Department of Commerce, Govt. of India. The Development Commissioner, CSEZ is the licensing authority for SEZ units and 100% Export Oriented Units (EOUs) in Kerala, Karnataka, Lakshadweep and Mahe. To cater to the needs of 100% EOUs located in Karnataka a sub office of CSEZ is functioning in Bangalore. The performance of the developers of new Special Economic Zones that are being set up in the State of Kerala and Karnataka is monitored by the Development Commissioner, CSEZ.